Nick Clegg didn’t exactly come across as coherent in last night’s debate between party leaders when David Cameron challenged him on the fact that the Lib Dem manifesto still calls for the UK to join the euro. David Cameron: "people need to know that the Liberal Democrats, in their manifesto, are still in favour of joining the euro...if we were in the euro now, your taxes, your national insurance would not be going on hospitals and schools and police officers, they would be going to Greece, and possibly other countries as well, and that's why I say one of the lessons to learn is let's stay out of the euro, let's keep our own currency and let's recognise what a massive strategic error the Liberal Democrats would have made." Nick Clegg: [nervous laugh] "No I'm not advocating entry into the euro, I would only ever advocate it by the way, if ever, if the economic conditions were right. If it was good for your jobs, good for pensions, good for savings, and of course it always has to be only decided, if we were ever to do that as a country, on a referendum where you can vote on it." The Lib Dems' manifesto states: "We believe that it is in Britain's long-term interest to be part of the euro." Say what? Since when, exactly, is Nick Clegg in the "No I'm not advocating entry into the euro” camp? The Lib Dems' manifesto clearly advocates UK membership of the euro stating: "We believe that it is in Britain's long-term interest to be part of the euro." When he last year said the Euro would "anchor" the economy against the "vulnerable exposure to international financial markets". Or that "The strict rules attached to the euro could emerge as one of the best ways to persuade the markets that we will put Humpty Dumpty back together again, put the public finances in order". Or when he said that refusing to discuss the euro was a "failure of political leadership"
Or perhaps, back in the days: "If we remain outside the euro, we will simply continue to subside into a position of relative poverty and inefficiency compared to our more prosperous European neighbours." Or, in the same article: "We will gain greater control over our own affairs by joining the euro. By pooling sovereignty, we will be able to extend sovereignty over economic forces which have long moved beyond the reach of national monetary policy”. “The single currency, far from being an agent of continental style corporatism, is probably the greatest export vehicle of Anglo-Saxon economics. The euro has done more to enforce budgetary discipline, to promote privatisation and force through labour and product market liberalisation in the rest of Europe than any number of exhortations from the IMF, the OECD, or the editors of The Economist." The Lib Dems insist that it is in the “UK’s interest” to join the euro. However, at the same time Nick Clegg a) recently admitted that being in the euro would have made the UK’s current economic situation worse b) now says that he’s “not advocating entry into the euro”. The truth is that the Lib Dems' mixed messages on the euro undermine the credibility of the entire party. Advocating a policy in their manifesto that constitutes such a fundamental change, and then not having the courage of their convictions to back it up, smacks of ‘old politics’ and dishonesty. It’s difficult not to draw parallels to their flip-flopping on the question on whether a referendum should be held on the EU Constitution/Lisbon Treaty. If he was serious about his euro pledge, Nick Clegg would spell out exactly under what conditions he would take the UK into the euro – which would be far more honest to voters. Nick Clegg’s confusion on the euro is at best folly, and at worst a threat to the health of the UK’s economy should he get near power. Is this what we should expect from someone who could become Britain’s next Foreign Secretary? “Who is Standard & Poor’s by the way?” asked Amadeu Altafaj, the spokesman for E.U. Monetary Affairs Commissioner Olli Rehn, as he took the podium at a regular midday news briefing at the European Commission. Getting angry at press conferences is not exactly likely to boost market confidence in Greek government bonds. Something about this statement didn't quite ring true - and it was the impression that he gave that his job as a trade negotiator was somehow a 'non-political job', outside the bubbles in Westminster and Brussels. But the problem is that this job was for the European Commission - not an institution that can reasonably be described as apolitical or somehow 'above politics'. See this interview, for example, with the President of the European Court of Justice Vassilios Skouris with the Financial Times in 2004, saying that "the Commission is a political body with the right of initiative." And, as we've argued at length before, the Commission is the institution which takes it upon itself to aggressively promote its own ideas on 'ever closer union', and which at times more closely resembles a political lobby group with its own agenda. Chris Huhne was also peddling the same line on the Today programme - denying that Nick Clegg was a political insider, having held "serious jobs outside politics" - which John Humphrys wasn't having any of. It may appear a technical point - but the suggestion that working for the Commission somehow represents a job outside the political world is utterly laughable. 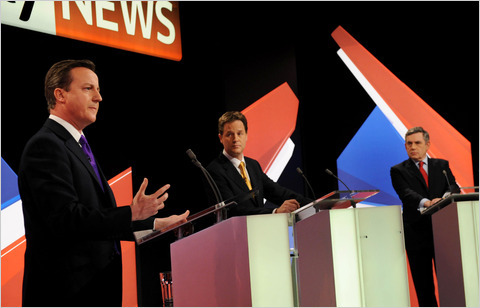 The Lib Dems' recent rise is rightly leading to closer scrutiny of the party's policies. Their support for the UK entering the euro, was correctly described as "folly" by the Sunday Times. If it wasn't right to join the euro when the UK was experiencing higher growth in comparison to the eurozone, and if you're willing to admit that the current eurozone interest rates would have hurt the UK's recovery (as Clegg has recently), then when would it ever be right to join? The Lib Dems' answer, "In the long-term", is simply not good enough from a party that wants to govern the country. But another area that has received far less scrutiny and attention is the Lib Dems' commitment to further EU cooperation on crime, justice and policing. This is extremely important because, under Lisbon, this is the area of EU policymaking that is likely to grow fastest. And for a practical example of why this is all important, we need look no further than a story reported in yesterday's Independent, and today in the Irish Times. Ian Bailey, a British former journalist suspected in connection, but not charged, with the murder of a French film-maker in Ireland 14 years ago, has been detained by the Irish authorities under a European Arrest Warrant issued by a French judge. French lawyers argue that they have jurisdiction over the case, citing the French constitution which states that murder cases involving French citizens in any part of the world can be brought in front of French courts. But, as Carol Coulter, the Irish Times' legal editor, points out, the Irish Director of Public Prosecutions decided not to prosecute Bailey for the murder. Therefore, in practice, the French extradition request amounts to a breach of the double jeopordy principle, enshrined in the European Convention on Human Rights (ECHR), as well as the Irish Constitution. We've pointed out some of the EAW's failings before, but this case could potentially prove to be a huge step in a very dangerous direction. If Bailey loses his fight against extradition, the Irish authorities will have deported someone, whom they believe did not have a case to answer under Irish law, to face charges in another country. Leaving aside whether Bailey is ever found guilty or not in the future, this simply cannot be right. The Irish courts still have to decide whether to action the extradition request but it will be interesting to see how much pressure is put on them by the French government. And given that the French request effectively amounts to a vote of no confidence in the Irish legal and judicial system, what prospect does this man have for a fair trial in France? And doesn't the UK, given that Bailey is a British citizen, have a duty to point this out? When [David Cameron] was running for the party’s leadership, I met him accidentally in the locker room of the House of Commons, while we were having a shower. I had gone jogging, while he [David Cameron] was back from a bicycle ride. I told him: ‘David, once you become a leader you have to give up one of the ideological pillars of your party, like all great statesmen do. Margaret Thatcher and Tony Blair did. I wish you will get rid of all those suspicions towards the EU’. He stared at me and said: ‘My dear Denis, I’m much more Eurosceptic than you may think’. Okay, we get it. Europe should brace itself for the most isolationist Western leader since James Monroe (slight touch of irony there). But did we really need to know about the shower, Denis? With the election only two weeks away now the country has turned poll-crazy as we rate the stars, ahem, politicians with every twist and turn of the election horse track. The latest intrigue from the poll-vine comes from an interesting study released in yesterday’s FT, by market research firm Harris International. 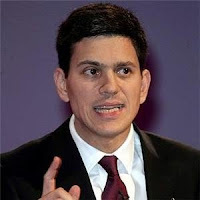 It reveals that David Miliband is one of the least trusted politicians in the UK, with a whopping 38 percent of people saying that they ‘distrust’ him in contrast to the scant 12 percent who ‘trust’ him. The surprise must come as quite a blow to Labour’s wonder child, and to the party who widely tip him for future leadership. The question remains, what has Miliband done to upset the voters? We think this poll shows that the public remember oh too well the failed promises that Miliband, and the Labour party, have offered and taken away from us over the years. In his role as Foreign Minister, Miliband promised to put an end to the UK’s role in overseas torture cases, but instead ended up publishing guidance as to how to interview detainees overseas. He also presided over the financial scandal that saw the Foreign and Commonwealth Office lose vast sums of cash after the budget was left unprotected from exchange rate changes. But in our view the most fundamental breach of trust was the reneged promise to hold a referendum on the Lisbon Treaty. Miliband was at the head of the party in the writing of New Labours' election manifestos which, as we well remember, promised us a referendum on a European Union Constitution. Strike 1 - the Constitution came and went without a referendum in the UK. Strike 2 – the identical Lisbon Treaty came and arrived without a referendum. By also leading the defence on the Treaty in the Commons (which a clear majority of the British people didn't want) Miliband is very much synonymous with the whole insult to democracy that the Lisbon episode involved. It’s no wonder then that the people don’t trust him. It's always amusing to witness journalists and politicians with euro-enthusiastic tendencies having a go at parts of the British press for being biased on Europe, while at the same time being guilty themselves of some seriously one-sided and dubious reporting. One of the most conspicous examples is when we caught the Independent - at the height of the debate about a referendum on the Lisbon Treaty - reprinting a Foreign Office briefing note on the Treaty almost word-for-word, but without any attribution that the FCO was the source. (Compare the Foreign Office briefing here to the Independent article here). A newspaper simply printing what the government tells it word for word is not considered quality journalism in most places. On Friday, the Independent’s John Lichfield got a bit over excited about the prospect of a Conservative government 'spooking' Europe. Quoting a couple of French politicians, a Spanish MEP and a second-hand “source in Ms Merkel's Christian Democratic Party” he predictably got stuck on the idea that Europeans these days live in perpetual fear of the Conservatives coming to power. A potential Conservative government is now up there with global warming and terrorism as the greatest threats to humanity (we made up that last part). The discussion about the Tories in Europe has always verged on the hysterical – and few people outside the bubbles in Brussels, Paris and Westminster pay much attention to it. But what’s arguably worse, at times it comes across as outright ignorant – despite all the lofty talk amongst commentators for the need to increase the quality of the discussion on the EU. That argument is alive and well around Europe – in fact, it is increasingly moving back to the fore. The German Constitutional Court used this exact phrase in its explosive ruling on the Lisbon Treaty to make clear its view on what the EU is and what it should remain (Verbindung souverän bleibender Staaten). Also the Swedish governing Moderate Party – which is at the mainstream of the mainstream of European centre-right politics – is using very similar wording to describe its vision of the EU (mellanstatligt samarbete). It does take knowing a couple of languages, but the information is quite clearly there for anyone interested in a quality report. But then again, the need for such reporting only applies to one side of the argument, doesn't it? Although Europe has been seemingly neutralised as an election issue, and the main political parties have reached a rather settled position on the Lisbon Treaty, it does not give them license to play fast and loose with the facts of what the Treaty means for the UK. "Have people really seen a huge difference in the relationship between us and Europe over the last few weeks? The reason we did not have a referendum on this is that there was no major constitutional issue that had to be dealt with. They abandoned the concept of a constitutional treaty. They actually specifically said, the European Union, that it was abandoning that idea and then they went to what is a more modest treaty, the Lisbon Treaty, where all what we called our 'red lines', that is no interference with social security or national security, we got what we wanted on policing and justice, we got what we wanted on economic development, we got the freedom to continue to have our own foreign policy - none of these things were affected." Quite a lot of total misrepresentation there, so we will do our best to debunk some of those fallacies. Despite repeating his argument that the Lisbon Treaty was vastly different from the European Constitution, and therefore no referendum would be required, everyone and sundry has admitted that they are essentially the same document (as well as the PM himself). We did the side-by-side comparison proving that they were practically identical. Valery Giscard d'Estaing, author of the original Constitution, said that it still contained "all the earlier proposals" of the Constitution would be maintained in the Lisbon Treaty, even if they had to be "hidden" or "disguised". Straight-talking German Chancellor Angela Merkel said it a little more bluntly: "The substance of the Constitution is preserved. That is a fact." The Government's red lines were an absolute myth. See our research on how they crumbled, one after the other. Not only did the Charter of Fundamental Rights become legally binding (Tony Blair said it wouldn't), but the Government most certainly did not get what they wanted on policing and crime. They wanted that entire policy area excluded from the jurisdiction of the European Court of Justice, but failed miserably, as well as arguing unsuccessfully for retention of unanimity in decision-making in this area. They also opposed the European Public Prosecutor, new powers for Eurojust to initiate criminal investigations, and powers for the EU to set minimum sentences...all unsuccessfully however. Only someone who has never, ever got what they asked for could attempt to spin this as 'getting everything we wanted'. decisions of the Luxembourg court on issues arising out of the Treaty of Lisbon, even to the extent that they involve criminal matters, would become binding on all of us... The development of the European Union, and the extended jurisdiction of the European court in criminal matters, will have a significant impact domestically. Twenty years down the line where will we be? Also on foreign policy, despite promising that it wouldn't be moved into qualified majority voting, this details in just how many areas of foreign policy the Government gave up their veto. As for the question of social security, read this research to see that there was no new 'red line' on the question of social security in relation to the Lisbon Treaty, compared with the original negotiations on the Constitutional Treaty. "But no constitutional concept was involved. There was no major constitutional or institutional change because of the Treaty, and I think everybody knows, because they haven't seen this huge difference between what happened at the end of last year and what's happening at the beginning of this year." To suggest that the Lisbon Treaty was not a major institutional change is, of course, absolutely ridiculous and suggests that the Prime Minister has little idea of exactly what competences have been transferred to Brussels with the ratification of the Treaty. For a comprehensive guide of what powers the Lisbon Treaty gave to the EU see our reseach here. Moreover, some of the improvements that were promised (increased powers to deal with crucial issues such as climate change, or more scrutiny for national parliaments) have been well and truly debunked in the last couple of months since Lisbon came into force. The scrutiny promised to Parliament over EU proposals has collapsed on various occasions (see here and here) and the EU was widely viewed as having been sidelined at the Copenhagen climate change conference. Sadly, they may get away with not talking about it, but Labour's failure to hold a referendum on the Lisbon Treaty amounts to a clear and unequivocal broken manifesto promise. To argue otherwise is a direct insult to democracy in general and British voters in particular. 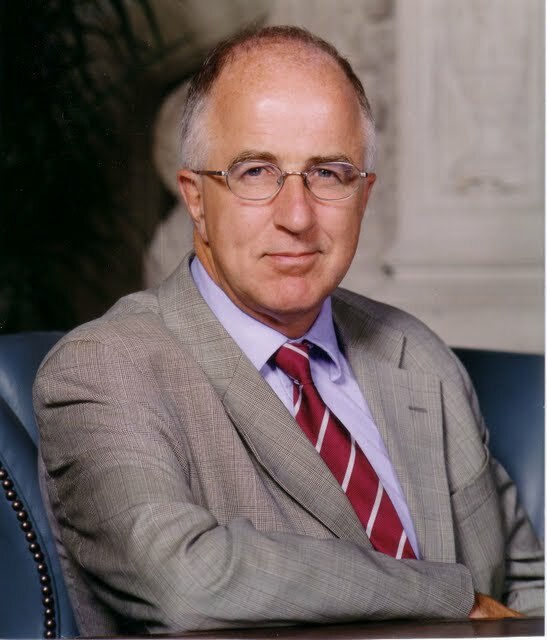 Considering that EU regulation introduced in the UK since 1998 has cost the economy £124 billion, we can only wonder what Prof. Tietmeyer would say in 2010. The first sentence is, however, perhaps more significant. This was a remark given in a speech about the introduction of the euro and, in hindsight, may prove to be very prescient. No one should take pleasure in witnessing the current difficulties in the eurozone, because, after all, they have the potential for much wider repercussions across Europe and the globe, but maybe eurozone leaders could do well to heed the Professor's message: European ideals are not sufficient to paper over fundamental economic realities. Eurozone finance ministers yesterday agreed on a €30bn loan commitment to Greece over the next year, as part of a three-year commitment, with the IMF potentially coughing up another €10-15 billion. The interest rate on the loans is set at five percent for a three-year fixed loan – above the IMF’s standard lending rate but below the seven percent level asked for by the markets last week. Greece has not yet asked for the loans, but if and when they do, this will mark the largest multilateral financial rescue package ever attempted. Unsurprisingly, the European media is flooded with reactions to the deal, and a worrying number of people appear convinced that even if the plan was to be put into action, it would only serve to postpone an inevitable Greek default (see here for instance). In the FT, Wolfgang Munchau bluntly states that "Greece will eventually default. The numbers simply look to bad." There are also suggestions that the package will have to be far bigger than the suggested €40-45 billion to have impact. A senior finance ministry official apparently told Reuters that, "40 billion for 2010 is part of a bigger amount for the three-year period. A logical amount for the three-year period would be double 40 billion." In addition, questions are now being raised over the compatibility of the deal with the bail-out/credit line ban in the EU treaties - and whether the deal will withstand a legal test in Germany's Constitutional Court. And then there are the national parliaments in Germany, Holland and Ireland, that will have to give their thumbs up before the plans can become reality. One thing is certain, this story is far from over. "What's left of the euro?" 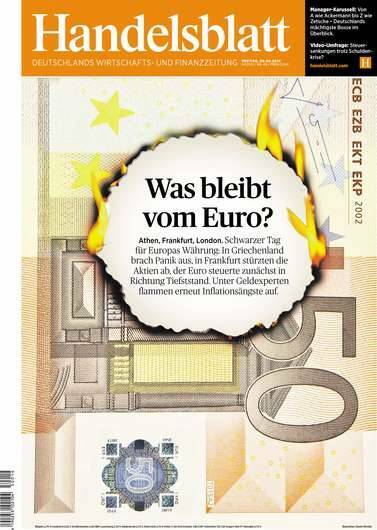 This question is asked on today's frontpage of Germany’s leading financial daily Handelsblatt, against the backdrop of a 50 euro note going up in flames (see picture). The quite sensational splash is apparently a reaction to ECB President Jean-Claude Trichet's announcement yesterday that the ECB would continue accepting Greek "junk" bonds as collateral - an announcement that came as interest rates on Greek bonds rose again, giving a clear signal that the eurozone's assurances of assistance to Greece are not enough to calm the markets. Trichet made it obvious that he has changed his opinion under political pressure. This has suddenly given rise to questions, which at least in Germany, awake traumatic memories. What remains of the hard Euro, when the Central Bank bows to political pressure? Will the debt crisis, which all Western states suffer from, be followed by a loss in the value of money? yesterday, the German Bundesbank died (...) ECB President Jean-Claude Trichet is no longer a follower of the monetary guardians in Frankfurt, who have set one big goal for themselves: never again inflation! Never again should savers and people with small incomes be deprived of the fruit of their labour...But in the Greek crisis it appears that the European Central Bank is pursuing political goals rather than the stability culture of its predecessor. One shouldn't over-read the mood in Germany, but this is strong stuff. One of the eurozone potential flashpoints was always Germany's stern anti-inflation view and fundamentalist belief in a strong euro. This view was bound to be put to a rather unpleasant test as soon as a real crisis hit the eurozone - triggering a range of unpredictable consequences. Well, that day has now arrived. One of the more mysterious - and tedious - elements of EU decision making is "comitology". The system works like this: after an EU law has been agreed by the European Parliament and Council (after having been proposed by the Commission), the Commission, aided by national experts, still has room for manoeuvre in amending or adding to the Directive at a later date, with limited involvement from the European Parliament and the Council (as we explain here on page 31). Whenever a Directive says that something will be decided through "implementing measures", this means that details of an EU law are hammered out in these comitology committees. On our way to Brussels, he tells me how he has decided what his input is going to be. Nobody higher up in the hierarchy seems to be involved in his case. There are no instructions. His ministry does not take a clear position regarding his file. today, without comitology, the EU would quite simply be at a standstill. Where does the political level stop and the administrative start? (...) The system has become totally out of balance because the implementating measures have come to +/- 2500 per year while only about fifty directives have been adopted during the same period. This is murky territory, but basically, "Delegated acts" are "quasi-legislative acts" which amend Directives. They have political impact and are therefore subject to scrunity by the European Parliament (according to a deal agreed in 2006). "Implementing acts" are very similar, but classified as "administrative measures" with no political impact and therefore subject to very limited parliamentary scrunity. Confused? We are too. But it's getting worse. 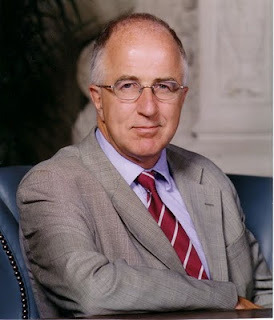 According to Guéguen, the Lisbon Treaty will blur the distinction between the two even further, and interpreation will vary from institution to institution. And MEPs are not quite keeping up. A press release from the European Parliament notes that an EP report on how delegated acts will work is due to be discussed in plenary in April. It notes that Hungarian MEP József Szájer, who is the author of the report, claims that the new system will mean a power boost for the European Parliament, arguing "The consequences of this change are considerable as the EP has achieved its historical maturity being placed on the same footing as Council." He concludes: "Henceforth, the institutional triangle is no longer an equilateral triangle. One side of the triangle, the Commission side, is now considerable larger than the two other sides." Perhaps a book that should be on MEPs' reading list. We've recently found that around 70 percent of the cost of regulations in the UK originates in EU legislation. In addition to that, 50 percent of the content of these EU laws could well be decided after the Council and the European Parliament have agreed on the actual proposal. And now the Lisbon Treaty would give the unelected Commission more powers to implement laws under the radar of public scrutiny. This Treaty's democratic credentials aren't exactly getting stronger by the day. German Christian Democrat MEP Martin Kastler has also launched an online petition, trailing the citiziens' initiative created by the Lisbon Treaty (whereby one million signatures will require the Commission to consider a request for a legislative initative in some cases), to call for Sunday to me made a work-free day across the EU. The campaign is called "Mum and dad belong to us on Sunday." The petition has received some 13,000 signatures so far. Now, few people like to work on Sundays and it's hard to argue against the need for some good, quality time with the family at least once a week. But come on, is this really something for the EU? And is banning work on Sundays what we need right now given the economic climate? "Twenty years down the line, where will we be?" Over the Bank Holiday weekend the Independent and the Telegraph both picked up on a lecture given by the aptly named Lord Chief of Justice, Lord Judge, last month, in which he warned of the growing influence of both the European Court of Human Rights (ECHR) in Strasbourg and the EU's European Court of Justice (ECJ) in Luxembourg. He concluded with a question that the Government has done everything it could to avoid: "Twenty years down the line, where will we be?" Both papers chose to focus predominantly on his comments about the growing influence of judgements from the ECHR on the UK courts and how this poses a challenge to the UK's centuries old common law legal system. The answer, Lord Judge said, is to ensure "that statute ensures that the final word does not rest with Strasbourg, but with our Supreme Court." The ECHR falls outside the realm of the EU, although, under the Lisbon Treaty, the EU as a whole formally acceded to the European Convention of Human Rights, which the Strasbourg court was established to uphold. And Lord Judge made some very interesting comments regarding this and the EU's growing role in UK criminal law more generally. They are worth repeating here as they went largely unreported at the weekend. Lord Judge's first point was that "the [EU's] European Court of Justice is beginning to acquire jurisdiction over matters that would normally be regarded as matters not for Luxembourg but for Strasbourg." He didn't expand much on this but it is an interesting point to watch in the future as there are clearly concerns that, with the EU acceding to the Convention, the remits of both courts has become blurred, with a risk of ECJ mission creep. 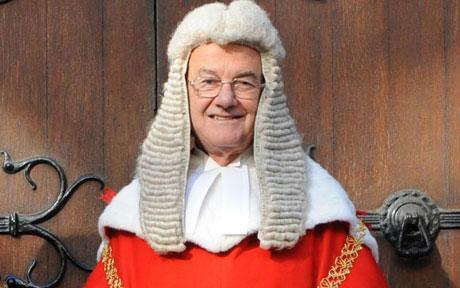 The first practical example to which Lord Judge refers is that, "The EU has recently signed up to what is called a 'roadmap' of five areas of criminal procedure which must be addressed within the next 5 years to protect and guarantee the rights of EU citizens. I thought that was the job of the Convention." It also raises difficult questions for the UK specifically, which can 'opt out' of much of the EU's new criminal legislation under the Lisbon Treaty but at the same time remains a signatory of the Convention of Human Rights - although David Cameron has said that he wants to review the Convention's impact on the UK. How will this work in practice, which will take precedence? The second major point is that "The Treaty of Lisbon has brought criminal justice matters to the core of the EU and with it the jurisdiction of the Luxembourg court." This means that if the UK does opt in to new EU justice and home affairs legislation "decisions of the Luxembourg court on issues arising out of the Treaty of Lisbon, even to the extent that they involve criminal matters, would become binding on us all." He concludes, "the development of the European Union, and the extended jurisdiction of the European court in criminal matters, will have a significant impact domestically. Twenty years down the line, where will we be?" This is not just an interesting question but a very important one. You'd have hoped that it had been debated and answered long before the Government signed the Lisbon Treaty. The Economist's Europe correspondent, Charlemagne, yesterday used his blog in order to launch a rather stinging attack on the state of the UK press' coverage of the EU. It seems to have been prompted by our latest report on the cost of regulation to the UK economy, and the proportion of that which comes from the EU. It is not for us to defend the state of the UK press but we will use this opportunity to respond to some of Charlemagne's comments on the report. Now, we need to be able to handle scrutiny just as we expect others to handle how we scrutinise them, so we appreciate constructive criticism. We don't claim to be disinterested, and we certainly make no excuses for highlighting where the EU goes wrong. The EU needs more, not less scrutiny by bodies not funded by the EU itself. But we do aim to produce material that is accurate. And we're trying to be critical but constructive - which we think our track record shows. We note that Charlemagne makes no mention in his post of the 30 or so suggestions we make in our regulation report for how to improve regulation and EU scrutiny (working within the EU)...it would be interesting to see him engage with those points as well. And to call our argument on the benefit-ratio "shocking" is a bit much, to put it mildly. Again, when adding all the extracted data from Impact Assessments together, the fact is that the benefit/cost ratio of UK regulations is 2.35, while the benefit/cost of EU regulations is 1.02. In pure quantified terms, that gives UK regulation, roughly, a 2.5 times more favourable cost-benefit ratio. We did not make that up. Note also that we excluded all the IAs which did not contain a quantified benefit (otherwise the discrepancy would've been vastly larger). Now, we can discuss what feasibly can be subject to quantification, the counterfactual and appropriate comparisons - we should be critiqued on all those points. But seriously, is it really 'intellectually insulting', as Charlemagne suggests, that we shed light on the fact that, according to the Government's own estimates, EU laws are more costly than UK laws relative to the benefits they generate? And given that it is the Government that includes such a ratio in its own impact assessments, surely this should be open to discussion? legislation: extending the scope of the right to request flexible working vs. EU legislation: preventing less favourable treatment for non-fixed employees. Quite apart from the merits of these laws, they are dealing with exactly the same parts of the economy and the labour market. Even in these areas we tend to see a similar benefit/cost ratio discrepancy, which led to our conclusion that is better, where possible, to regulate nationally. Charlemagne also says that: "But without regulation, there would be no single market. Some of that regulation will be designed to keep skittish, hygiene-obsessed German or Danish mothers (for example) calm about food safety, and ease their fears about dangerous salami being imported from the far corners of the EU to poison their blond-headed moppets. That may be expensive, but that fuss-potting gives political cover for the Danish and German governments to approve EU enlargement to countries like Romania or Slovakia, and that is really good for the long-term health of the EU. How do you possibly measure the costs and benefits of such things?" Sure but, given that regulation is the principle means by which the EU is used to exercise power, if we do not debate the relative trade-offs between excessive EU health and safety regulation, for example, and what the UK gets in return through enlargement, for example, what is the point in debating EU issues at all? From a UK point of view, the question should surely be 'at what cost is the UK furthering its interests through the EU?' There is a sensible, if complex, argument to be had here. "However, there are also clear benefits stemming from EU regulations and, overall, the benefits of being part of the EU's regulatory regime - and therefore the Single Market - still outweigh the costs on pure economic grounds. Some regulations emanating from Brussels serve to free up markets, improve consumer protection, reduce costs and so forth." "There are EU regulations that would have been put into place anyway. However, clearly some laws would not have existed. And crucially, while the broad framework of many EU laws may have existed in the UK anyway, a whole range of prescriptive requirements contained within these laws certainly would not have [we give some examples]....And quite apart from the actual proportion, the source of regulation is vitally important both in terms of practically amending or changing it and in terms of political accountability." The fact is that there are many more nuances to this debate - and indeed to Open Europe - than Charlemagne sets out in his blog post. And by simply dismissing our arguments without properly challenging them he risks being guilty of the same crime he accuses much of the rest of UK media of.